People Like You Routinely Ask, "Why is Collision Repair Important?" Well, in today's busy, congested, overstimulated world, you never know who will be driving next to you, behind you, or towards you. Distracted driving is the scourge of the roadways, causing more and more unfortunate vehicular incidents each and every day. Combine that with the areas congested roadways, your vehicle's regular interaction with people in neighborhoods and parking lots and all the environment factors, and you have a nearly unavoidable recipe for some sort of car damage. But don't worry, you are not alone. We are accustomed to the wear and tear this world puts on your car and are here to help. Who needs friends when you have drivers like these? If you’ve been in an accident, or your vehicle has damage that you would like repaired by the very best in the business, simply call or drop off your vehicle at our shop. Our excellent staff works side-by-side with leading insurance providers to help complete a free computerized estimate and accurately assess any damage before we begin making repairs. After your vehicle is assessed, it moves into our body shop, where we remove all damaged parts requiring separate repair or replacement. We will then perform body and structural repair work which will undergo rigorous quality inspection. Unfortunately, automotive accidents happen, and if you’ve been in one you've seen just how quickly a great-looking car can lose its luster. Fortunately, our collision experts can restore your ride to its original state! Our certified team will remove dents; fill, grind, and sand affected areas; and apply matching paint to your car's body. We will restore the structural integrity of your damaged vehicle during the repair process and bring your vehicle back to pre-accident condition. The frame is the main structure of a motor vehicle and all other components fasten to it. Usually the frame can withstand a lot of stress because it is made of very hard and strong metal. However, this does not mean that the frame is 100% resistant and can be damaged during an intense collision. This can affect other body parts of your vehicle if not repaired. To get you back on the road asap, you need experts who know the proper way to restore your vehicle. With the help of our amazing mechanics working on your vehicle’s frame your automotive will be back to, and looking better than, its pre-accident state. For fast and reliable collision repair services, contact us at 410-355-6232. Everyone knows that scratches, scrapes, and fading can occur on any vehicle. Whether it’s through every day use or a serious collision, your car’s paint can be damaged. To get your vehicle looking fresh and protected against corrosion a good paint job will be needed. Luckily, you can get more for your money with our trained professional auto-body painters. 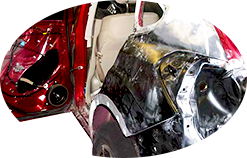 With 20+ years of experience our professionals will give your automotive a decorative and protective layer that will make it look like it just came off the assembly-line. The collision repair industry understands the importance of welding for consumer safety. This requires more than just state-of-the-art equipment. It involves having properly trained technicians who know the latest industry techniques, have the highest quality of skill, and the proper shop equipment available. Here at Moore’s you can rest assured that our certified professionals, who have been properly trained in all aspects of automotive welding, will restore your car so it’s looking like brand new.